From Richard Hill's Common-place Book, Manuscript 354, folio. 178, pp. 374-375. Source: Frederick Morgan Padelford, ed., Early Sixteenth Century Lyrics. (Boston and London: D.C. Heath & Co., 1907), pp. 75-76, 138-139. I met with a foster he bad me a bide.
' With hay go bet, hay go bett, hay go bett how ! We shall haue game & sport ynow! with: 'Yer he goth, yer he goth, yer he gothe, how! but the hart was over throwe. 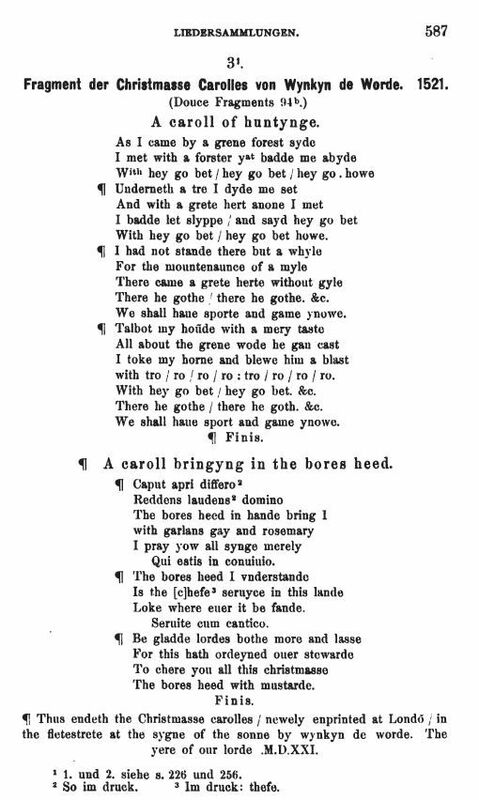 This hunting-song may have been sung at some one of the elaborate revels that distinguished the earlier years of Henry's reign. From internal evidence it seems probable that a similar song in Add. Ms. 31922 (f. 65b. ; cf. transcript in Anglia 12. 144) was sung at the revels held at Christmas, 1514. (Compare the song and Let. and Pap. I. 718, 4642.) For other 'foster' songs, cf. Add. Ms. 31922, 69b (Anglia 12. 245, Neuenglisches Lesebuch, 151), Add. Ms. 5665, f. 53b (Neuenglisches Lesebuch. 151), Royal Ms. App. 58, f. 5b (Anglia 12. 262, Neuenglisches Lesebuch. 152). Note: Both of Wynkyn de Worde's songs were also reprinted by Flügel in Anglia, Vol. 12, p. 587 (below). With hey go bet, hey go bet, hey go howe! with hey go bet, hey go bet, howe! there came a grete herte, without gyle. We shall haue sporte and game ynowe! all about the grene wode he gan cast. We shall haue sport and game ynowe. Professor Padelford gives the following attribution: Wynkyn de Worde's Christmasse carolles, Bodl. Douce Fragm. 94b. ; Ang. 12. ; emend. aft. Prof. Flügel. Entitled A caroll of huntynge, and foll. by Finis.